This is one of my favorite passages, which surprises even me, considering my tenuous relationship with Paul’s writings. But, that’s neither here nor there. I love the tension Paul points out here – being in the world but not of the world – being living sacrifices – being transformed, not conformed. And yet these are some of the hardest words of scripture. Especially if you’re like me, and you really like your iPhone (Or Android. No judgment) and laptop and streaming television and could really use some retail therapy at the end of a long week. While I love Paul’s words, reminding us to be in, but not of, the world, I resist simplistic interpretations that tempt us divides culture between sacred on the one end and secular on the other. I do not believe Paul’s intention is to create a Christian subculture that essentially mirrors every other facet of culture. We could also dwell today on this passage in the typical, predictable ways of rejecting consumerism and living simply. And those are really good goals, and God knows I need those challenges too. But today I want to take the opportunity this day to talk about what we do as a church that really must be countercultural. On this day, Promotion Sunday, on this day that we are working our way back to a fuller Sunday Schedule, on this day where I am humbled to have put in a full year as associate pastor of this church, on this day, I want to offer some reflection on what it is I do – we do together – that is shaped by Paul’s admonition. I want to explore what it is that Paul writes that has anything (and everything) to do with Spiritual Formation. These verses from Paul are often taken in small chunks, out of the larger context – and I am just as guilty. We take the first verse – and isolate it to talk about being a living sacrifice. And then we take the next verse and read it alone to talk about conformity versus, say, swimming upstream. And finally, we read the last few verses to hear Paul call us the body of Christ. We are many members and form one body, he tells us. All of us have different gifts – of equal value, worth, and potential. A lot of sound bytes in these few verse. Today, let’s move beyond the excerpts to the whole passage (and if we had time, of course, it would, of course, be well-worth our time and attention to see them in the larger context of Paul’s letter). We are to be a living sacrifice, we are to view ourselves as equal partners in Christ’s ministry – as Christ’s body. What is more counter-cultural than that? What message flies in the face of worldly conformity than this? When we take this passage from Paul and look at how he connects the idea of being a living sacrifice with being transformed through renewing our minds, with being wrapped up together in the body of Christ, we can sum up his teaching here by reframing belonging – how and to whom do we belong? We are often led to believe that we belong to ourselves and ourselves only. Our culture – our world – certainly communicates a strong individualist ethic to us – seek first, not God’s Kingdom, but our own desires, needs, success, happiness, security. But what Paul tells us is that we belong to Christ and we belong to each other. There can be no selfishness, there can be no singular focus on individual success in this ethic. Nor can we continue to fancy ourselves as ‘special’. Think about our self-esteem culture – which has fed feelings of entitlement and failure to see others as equally valuable as ourselves. What Paul’s words remind us is that we are all special and we are all special – as children of God, gifted by God – but no more or less than anyone else who shares God’s image. Further, the countercultural message of the Gospel is that we are dependent on one another, and we are called to be who God called and created us to be – in community with one another as Christ’s body. So what does any of this have to do with spiritual formation? The reality is that understanding anything we do in church – let alone spiritual formation – as counter-cultural can feel downright counter-intuitive. We have in so many ways bought into the idea that American culture is the same thing as Christian culture (if there is such a thing as “Christian culture”). We have heard preachers tell us that God’s will is for us to be happy – boiling God down to a therapeutic presence, and God’s “plan” for our lives down to simple, checklist steps to a fruitful life. We have been told by some that our success, our wealth, our health, our stability in life is directly correlated to our spiritual health, which boils our faith down to a karmic system. Nothing in the Gospel promises an easy road, financial success or even sustained physical health in exchange for a life of committed discipleship. In fact, if we read and take Jesus’ words seriously we hear warnings of the dangers of pursuing money and worldly definitions of success. These worldly ideas have infiltrated our churches and caused us to define numerical growth of congregations with spiritual vitality. We believe that the busier our calendars, the more “product” we can provide, the stronger our congregation must be. Again, there is nothing in the Gospels – there is nothing in scripture – that would lead us to believe the more programs, the busier our schedules, or the higher our roster-numbers, the more favored we are by God, or the more likely we are doing God’s work. God’s work is done well and faithfully in the smallest of churches, and the Gospel is perverted in the largest churches with growing numbers – and vice-versa on both counts. Size, it turns out, doesn’t much matter. Neither does schedule. What the Gospels do tell us, is that relationships matter. Scripture tells us that covenanting with God to seek first God’s Kingdom is our primary task. When it comes to Spiritual Formation – when it comes to our identity as a congregation as the body of Christ, I think we are challenged in a couple of different ways to live together transformed, rather than conformed. We are challenged to form relationships, and value and cultivate those above prizing programming. How do we become a community of intention and meaning – not just one that focuses on staying active and busy? One way is to re-orient our relationship to time. Our cultural context is one of unrest – in the face of terrorism, war, environmental destruction, economic instability, the fear of failure in the midst of an individualist attainment culture – we are driven to restlessness. If we are idle, if we are not moving from one to-do item to the next, we are led to believe that we are going to be left behind. And yet, at the heart of our faith is the command of Sabbath – that we ought to live by and operate on a different calendar, one that holds as a given the necessity of pause. Of rest. Of stopping our busy-ness, our labor, our schedules to delight in God, one another and creation. We give air time to the knowledge that God commands us to rest – that the Sabbath is one of our primary commandments. And yet, how difficult is it to live into this commandment? When God commands us to keep the Sabbath, it is not about showing up for an hour of Sunday School and an hour (or so) of a worship service. 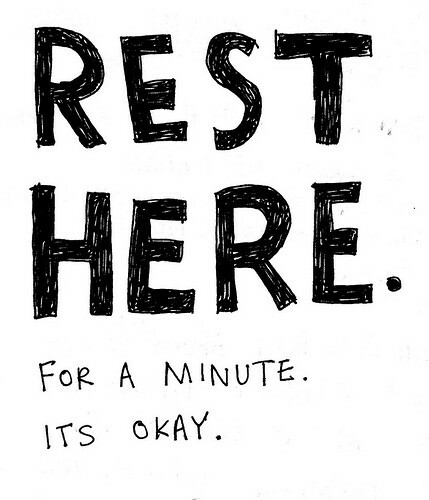 It’s about ordering our lives differently, prizing rest and delight. It is difficult enough to do this as individuals – but how, as a church, do we make it impossible for one another to keep the Sabbath? In a culture structured around activity, and unrest, and continuous involvement, how have we created the church in the image of culture – as another series of programs and activities to fill our schedules, as opposed to a place of rest, delight, and community? It is true, that as churches we often make it very difficult to allow people to take – and keep – the Sabbath – to cultivate relationships – with God, families, their interior lives. 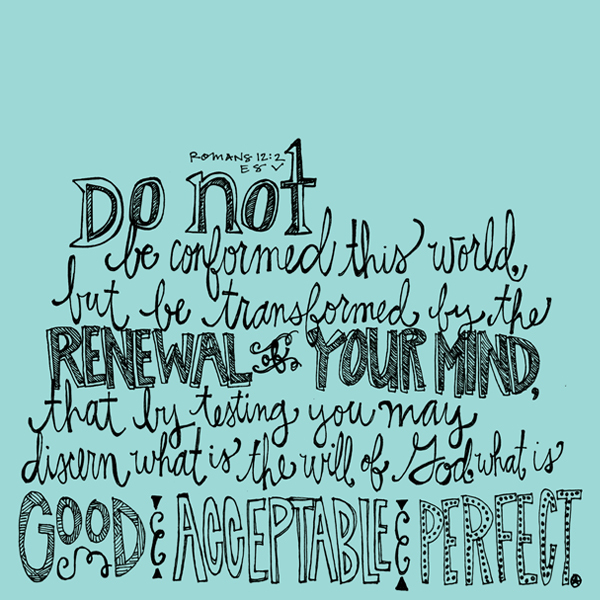 Paul’s words point out the necessity of embracing God’s gift of renewal – renewing our minds and our bodies. Therein will we find God’s peace and God’s plan. By committing ourselves, by seeing ourselves as integral to the body of Christ, will we discover God’s shalom. None of this will we find in our acquiescence to our surrounding culture. Pastor Carol Howard Merritt writes, “Even when our email inboxes are full of exciting last-minute, one-night getaway packages, we can turn off the computer and recover our strength. Even with the endless demands of our jobs, we can ignore the cell phones and pagers for a day. Even with the pull to entertain our children, we can stay home from the mall. When we embrace God’s good gift of renewal, we can gain perspective on our lives.” Paul’s juxtaposition of nonconformity, renewal and finding God’s will is not mere stump speech or sound byte. It’s Gospel. I want to highlight one of these things Rev. Merritt names: the gift of genuine and intergenerational community. How infrequently in our other contexts do we have the opportunity to interact with, develop relationships, listen and learn from folks older and younger than us? Our culture is not an easy place to meet people – to develop friendships, lasting relationships, forming community. Something you may not know about me is that I love flying. I love that I can arrive at the airport, check my bag (or lug it through security if I’m not lucky enough to fly Southwest), get on a plane, sit and read, fall asleep, listen to music and wind up somewhere totally different – somewhere it might’ve taken me a day – or more – to drive. The other thing I love about flying is that I have no control over the people who will share that space with me. This may seem a little too insecure – or even dangerous – to some of us, but it is people watching at its finest. I was thinking about this in the context of the sermon today – about the Kingdom of God – the Body of Christ. And how counter cultural it is – increasingly countercultural – to occupy space and time with folks so vastly different from us, to lack choice in whom we interact with. Even though we live in an increasingly globalized culture – people from all over the world are literally within reach of our fingertips through our screens – we continue to find more and more ways to isolate ourselves, to sequester in groups of people who talk, look, think, behave just like us. We have increasing ways to opt in or out of interpersonal interaction. And more often than not we opt out. But here’s where my metaphor breaks down. Because, see, when I fly, I do not talk to other people. Some of it is that I dread the question “So what do you do?” and the, shall we say, interesting conversation that will follow if I am honest. At best, I choose to withdraw into my earbuds and magazines because flying is a rare opportunity to tap into my inner introvert. At worst, I do so because I embody the isolationist, even fearful, culture in which I live – and help create. But what Paul’s words say, what we are called to do, is engage those around us. We are called to build relationships with one another, recognizing that God places us in community with all kinds of folks who are no more or less his children, made in God’s image, than we are. When we fly, all we know when we book our ticket is we need to get to X place on Y date. And we get to occupy space with any number of folks who also need to make at least part of that trip with us. Some folks travel for vacation, some for family obligations, some out of celebration, others out of mourning. Some make these trips for business, others seeking something. Just like that – the Kingdom of God is made up of all kinds of people seeking different things – some wounded, others looking to rejoice. And we have no control over it. All we know is that God has called us to be community together. God has called us –God has created us to be the body. If I am being perfectly honest, I will probably not start talking to strangers on airplanes. All the same, the call for our church is still clear. Our call is to be countercultural – and yes in the predictable, yet true ways of resisting consumer culture, and individual culture. Our call is to countercultural in other ways too – in resisting conformity in large and small ways. May we, in everything we do, embody the call to be transformed. May we resist conforming to the patterns of our world, recognizing that the only truth we are called to proclaim is that we belong to Christ and we belong to one another. Carol Howard Merrit, Tribal Church: Ministering to the Missing Generation. The Alban Institute: Herndon, Virginia, 2007. 148.